In deep sorrow I take my leave of Peter Kruse who died suddenly and unexpectedly on 1st June. His bond with OUBEY was indeed singular. He himself described it as a “spiritual kinship” and the encounter with OUBEY and his works led postumously to a close relationship that very quickly blossomed into a friendship between the three of us. In the statement he made on the 5th Anniversary of OUBEY MINDKISS, just five weeks ago, Peter Kruse expressed this once more in highly personal terms. And suddenly overnight this statement has become his parting gift. Now both of them are united in the same undiscovered world about which we the living know only one thing – that all of us one day will be there. 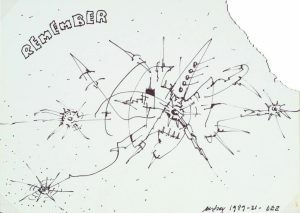 This drawing by OUBEY is one of those which hit Peter like a jolt of electricity when he first laid eyes on it. “I know exactly what was going on in his mind while he was drawing it!” was his astonished spontaneous comment. And I believed him implicitly even though it was clear to me that this really couldn’t be the case. But that’s how it was. Today we dedicate this drawing to our friend Peter Kruse with the wish that that for which he stood and that he sought to advance will not fall into oblivion, and in the hope that it will continue from strength to strength in the future. Read more on this and our farewell letter to Peter Kruse in the current OUBEY Blog. Vor kurzem fragte mich jemand, weshalb ich im OUBEY Blog so viel über inhaltliche Themen schreibe und nicht viel mehr über meine Erlebnisse und Erfahrungen im MINDKISS Projekt oder meine persönlichen Gedanken zu OUBEYs Bildern. On the occasion of the 7th stopover of the OUBEY Global Encounter Tour on 18 December 2015 over 50 artists from Kampala and further afield came together for an experimental workshop to express the associations aroused in them when viewing OUBEYs paintings by painting themselves. Host of this happening was the Naganda Academy of Art and Design (NIAAD).